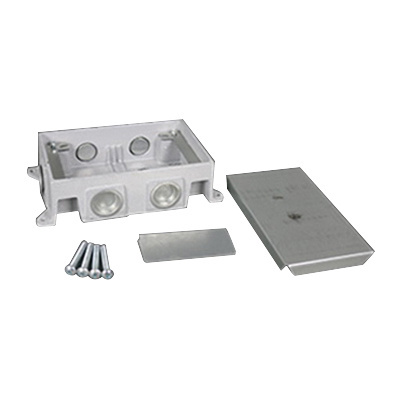 Wiremold OmniBox® 2-Gang 6-outlet shallow fully adjustable floor box features cast iron construction. It is suitable for schools, financial institutions and commercial office buildings. Rectangular floor box has a dimension of 8-1/2-Inch x 2-7/16 x 5-3/16-Inch. It has a maximum capacity of 76-Cubic-Inch. This floor box features one 3/4-Inch knockout. It supports carpet cover mounting. The integral design of this floor box keeps out water, dirt and debris from the power and communication compartments. It accepts industry standard and proprietary devices from a wide range of manufacturers to provide a seamless and aesthetically pleasing interface for voice, data, audio and video applications at the point-of-use. Floor box is UL listed and CSA certified.